You have acquired so much wealth and land. And it seems there is no limit of more land to acquire. But what’s the point of having all this land. There’s nothing to do with it all. And many others have nearly as much land as you now. But wait your explorer has just arrived from a long journey. It seems from his report that a ruler far far away, who also has lots of land. Has in his possession lions, tigers, and bears to show off his power. So that’s what we will do but even better. With so much land we build a royal menagerie. We will send even more explorers, adventurers, and naturalists out to capture any animal we can find. Yes it will be dangerous the savanna has an animal that laughs before attacks. And in the jungle there is reports of ruins and temples and cannibals and many may end up as lunch for those tigers. But that is a sacrifice I’m willing to make to bring these to the people. Yes even the common folk will be able to see these animals in person, they can pay with there cats and dogs, the lions will be hungry after all. And then we will truly be the envy of all those around us. 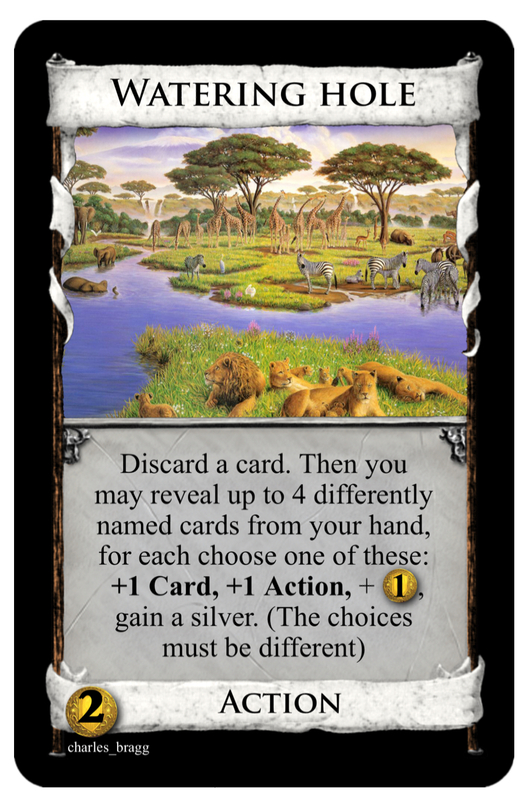 I am planning on having animals in this expansion as Actions. 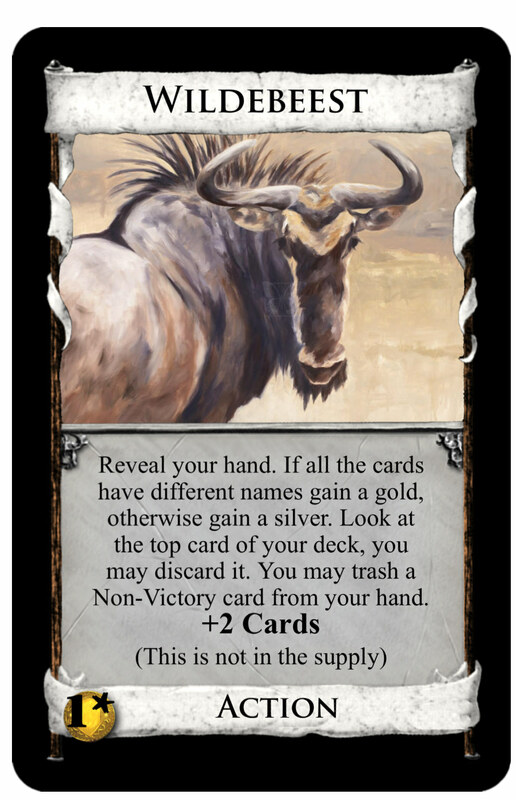 However some of the most endangered will be victory cards. 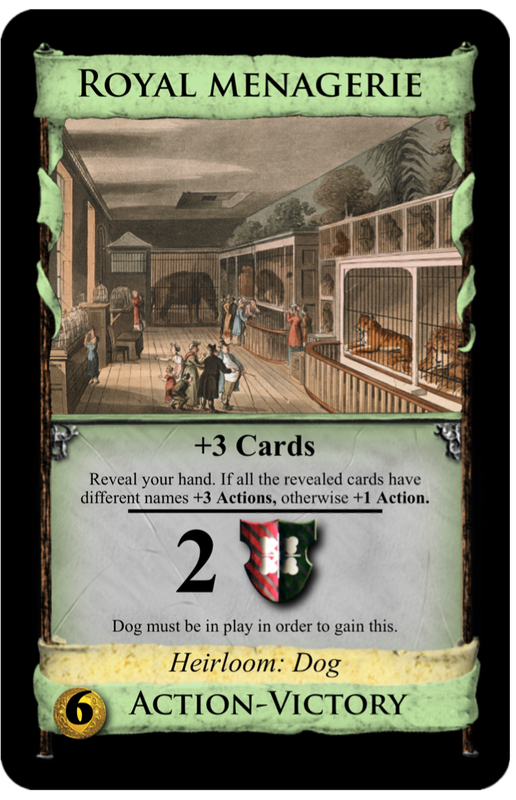 Dogs and cats will be treasure cards. Which you won’t be keeping for very long. After all the lions are hungry. Your probably all thinking why would I put dogs and cats as treasures. Well first of all goat is a treasure in nocturne. Plus that’s what the common folk would use as payment, if they wanted to go the menagerie. 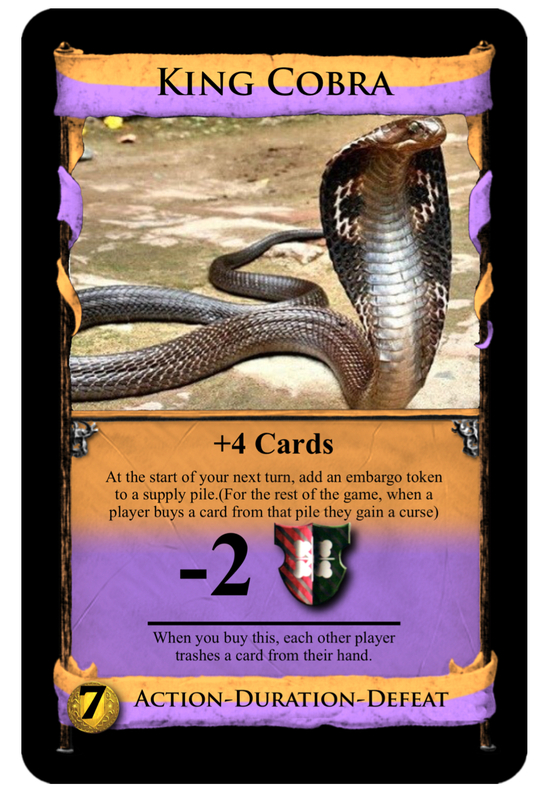 And yes some of the dangerous animals will be attack cards. Lyle's mom: Are you guys going to play regular Dominion, or are you going to play cheat? Lyle: Of course we're playing Cheat Dominion! 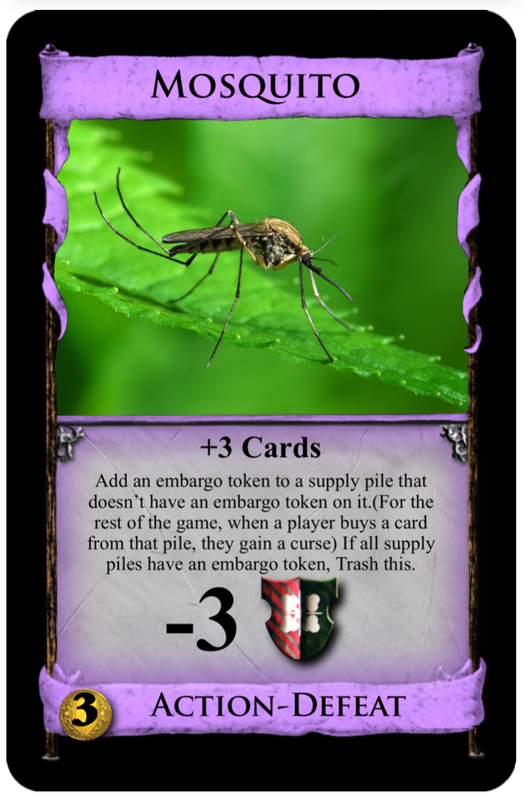 This will be the post where I’ll keep all the cards to start with. So there’s the first few cards. 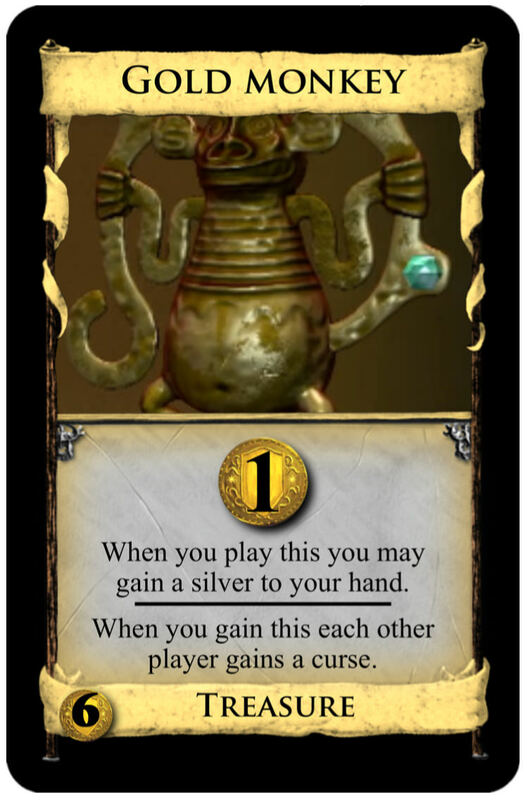 As you may have noticed there are some cards similar to cornucopia. 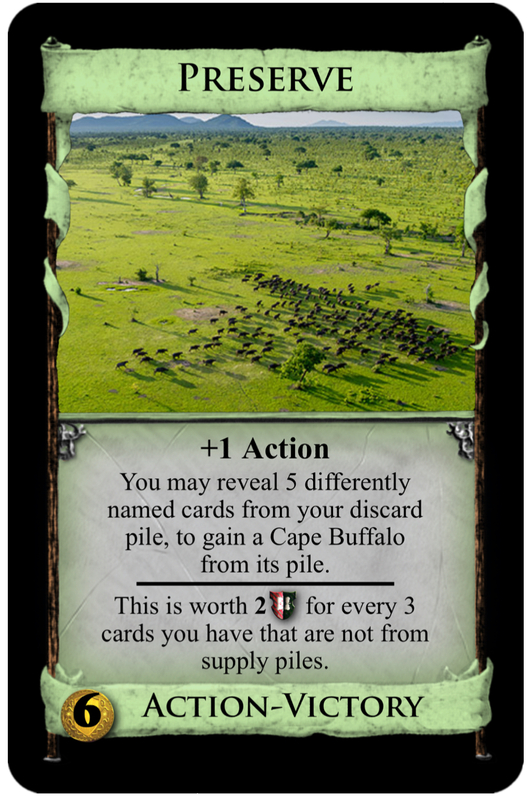 Cornucopia is my 2nd favorite expansion. 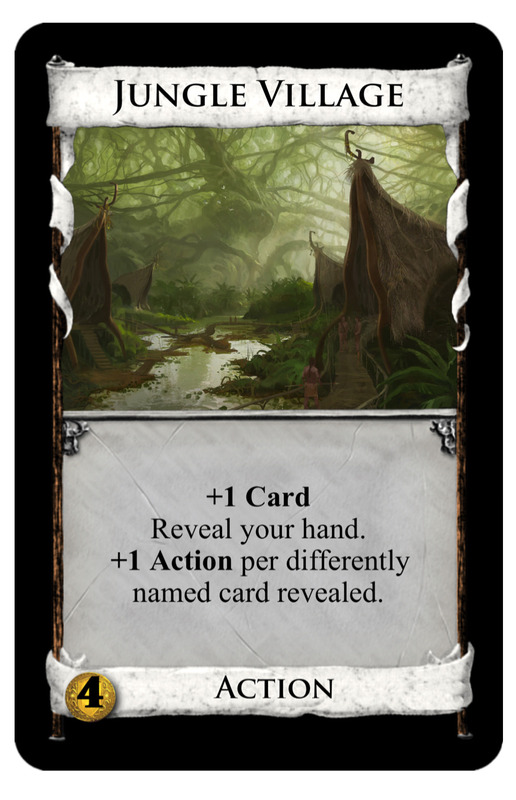 One reason is because of the differently named card reward. 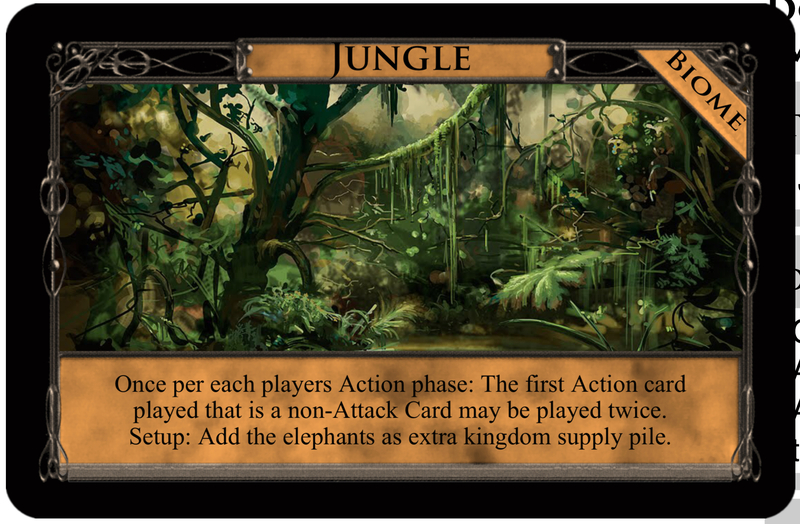 Jungle Village is pretty good; I'd rather do +1 Action per differently revealed Action card. Tiger is too good, it is better than Dame Josephine and Sir Destry combined and gets the Giant-like cursing on top of it. I'd be very careful with unlimited handsize attacks like that of Langurs. 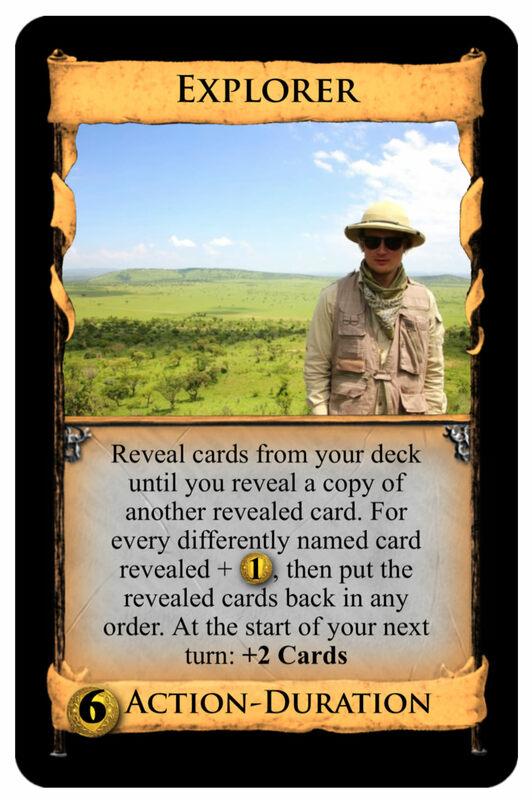 Even though it is hard to set up, a deck with 5 Langurs is no fun for the opponents. 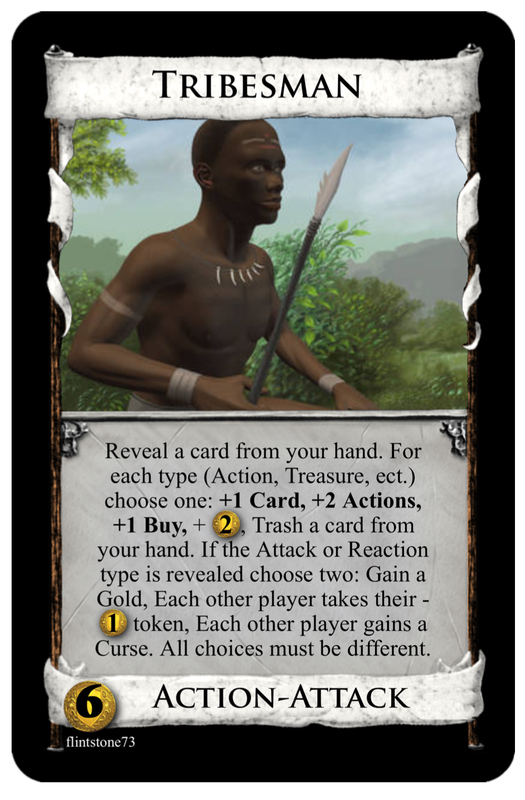 Note that the only other unlimited handsize discard Attack, Torturer, has a second option for the attacked player. Well the great thing about cards that aren’t in the supply. Is they don’t have to be at least 10. 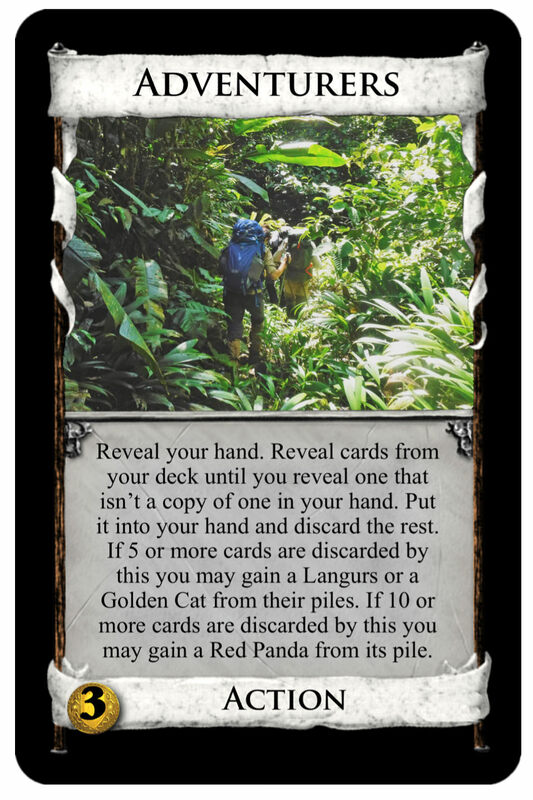 So I was planning on making Langurs and golden cat at least 5 or 6 each. 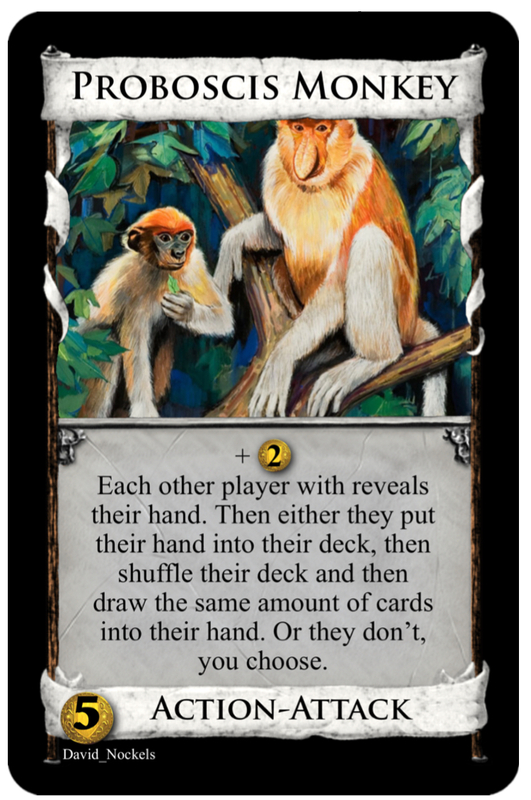 So you would have to be the only player to gain langurs for everyone else to discard their whole hand. Not likely though. 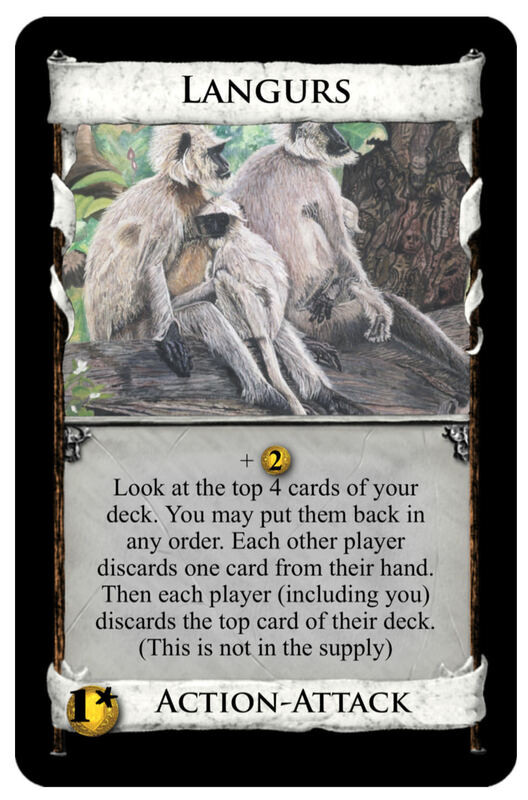 Even in a two player game you would still probably not end up with every langur, maybe 4 of them. 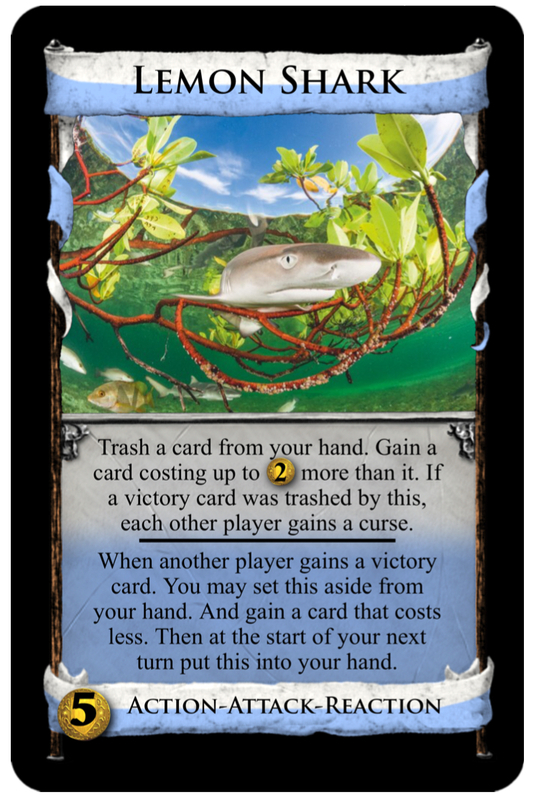 And if that was the case you would most likely have to your deck in one turn for it to be devestating to the other player. 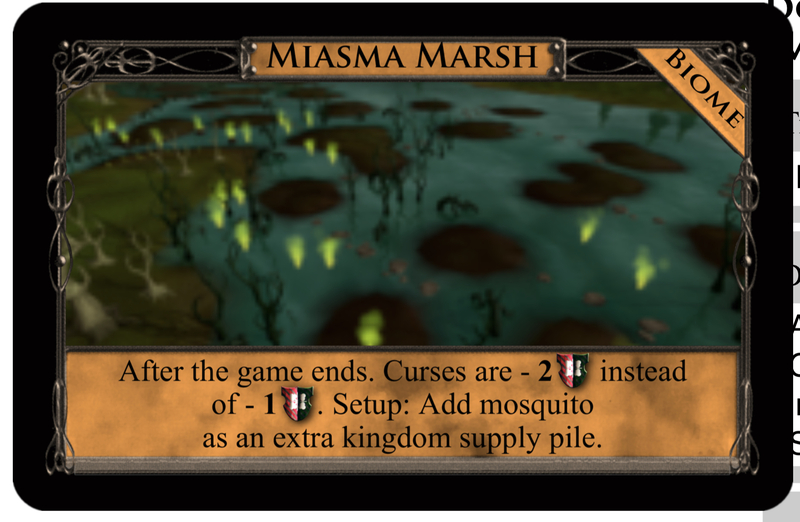 Which means you would have to have a lot of villages in your and or villagers in order to pull that off. And after all if did still end up with 4 in your hand at the start of the turn, you still would only get to play with one. 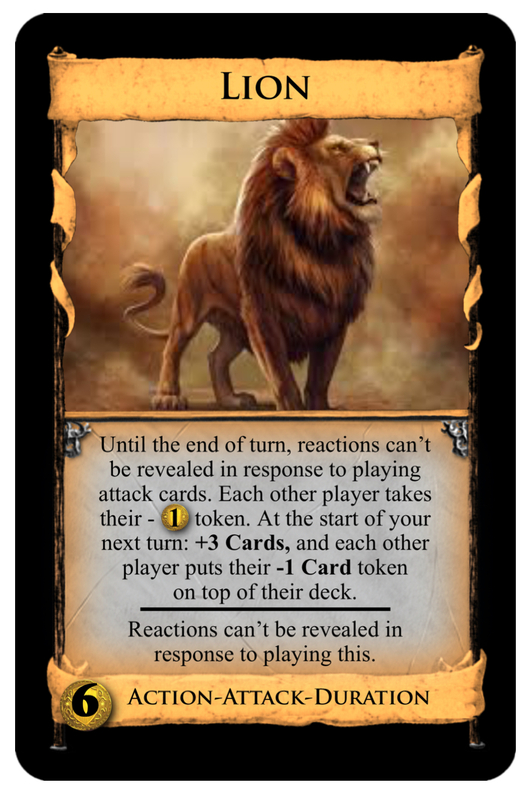 They don’t give out extra actions and they don’t let you draw cards. I still plan to have a normal amount of victory cards. And I just wanted to show a tigers power off by starting off powerful. 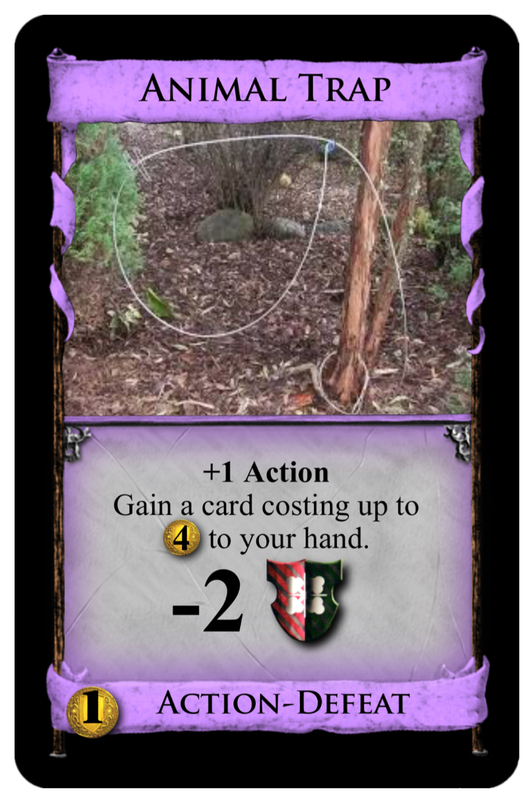 I might raise the cost or make it +2 Cards instead. I’ll just wait and see what other people think of tiger before I change it. 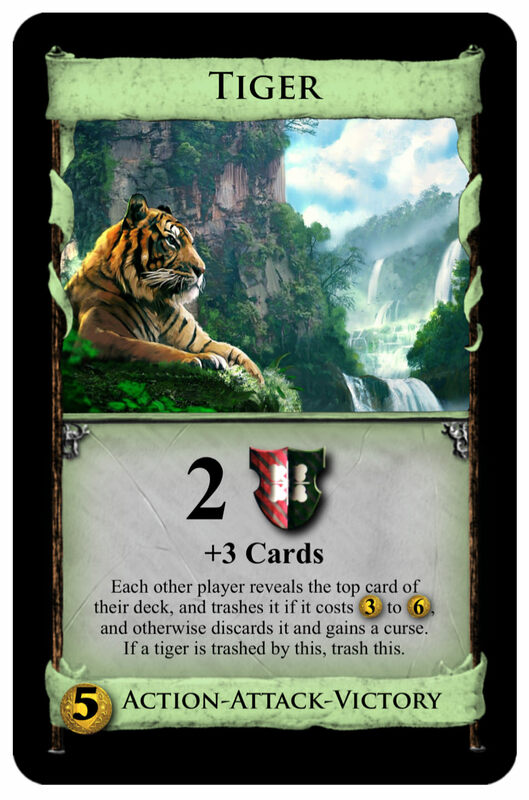 Also some players may not want to play it too much towards end of the game, so that way their tigers don’t kill each other. 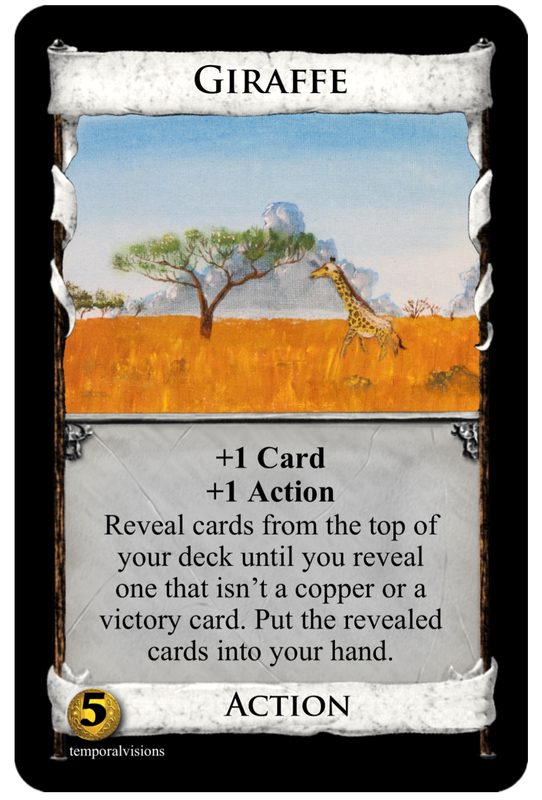 And I also might try to make a new type of card that involves just the animals. But I wanted to wait until I have all the animals in the game posted. Plus some are a little harder to do it with like tiger. It would be nice if you could have space for 4 different types just like nocturne has a couple that are 4 different types. Action-attack-spirit-doom or something I think. Wildlands will cover at least 2 or 3 biomes. And of course not just animals. 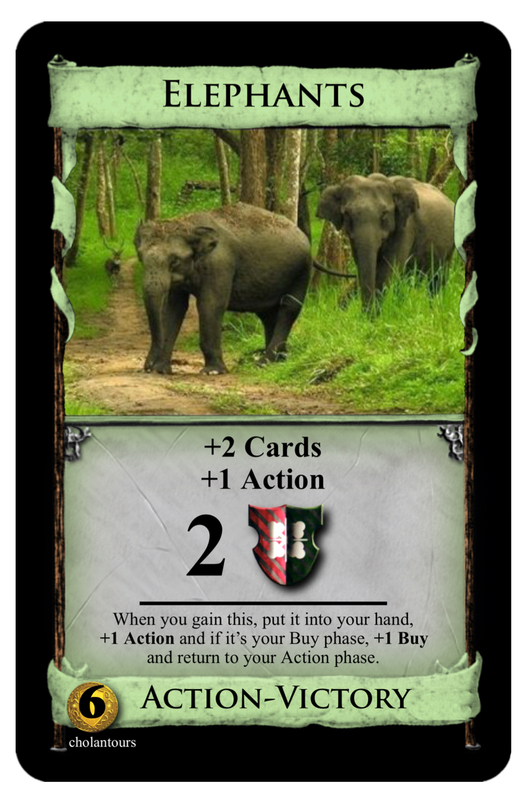 Jungle village and adventurers aren’t animals, so there should be plenty of other cards different from animals too. Oh and all animals will be real animals. There’s two different golden cats. The Asian golden cat and the African golden cat. Of course not all animals will have their full species name, like the langurs card. Just compare Tiger to Nobles, Destry, Josephine and Giant (there is a reason Giant only hits every other time) to realize how crazily overpowered it is. The adventurers seems like a good card. Maybe golden cat should be moved to ten also. 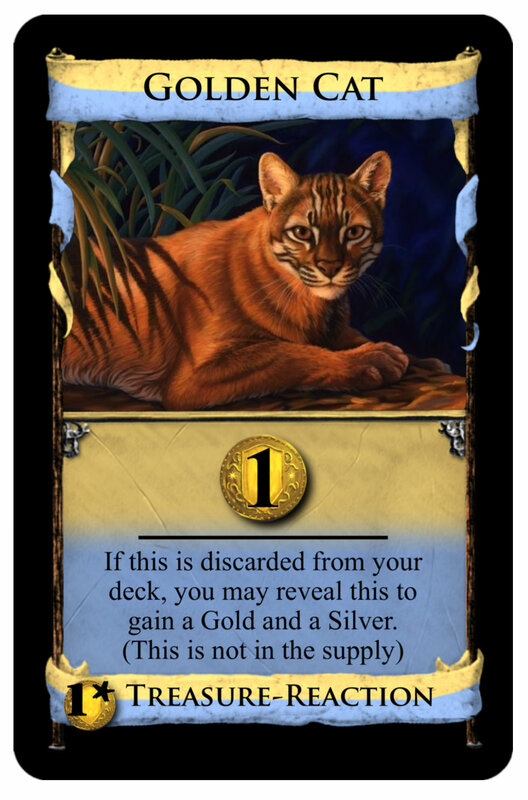 If you have a golden cat in your hand and play adventurers and discard a golden cat you'll get tons of golds and silvers. It would be bad in a colony game though. 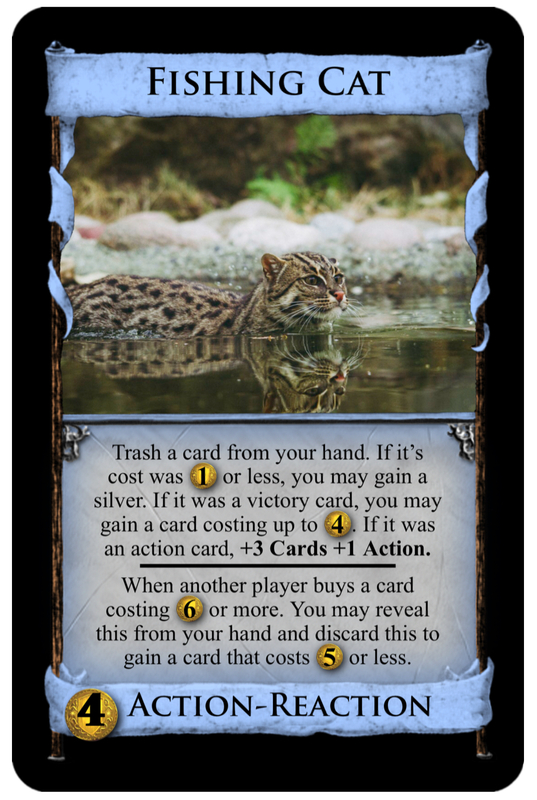 Hmm yeah I know tiger is overpowered hmm I might make it just golds for golden cat compared to tunnel golden cat only gives treasure when discarded from your deck. Tunnel gives you gold when discarded from your hand as well. And tiger do you guys think it would be better if it gave +2$ and costed 6$ instead would that help? 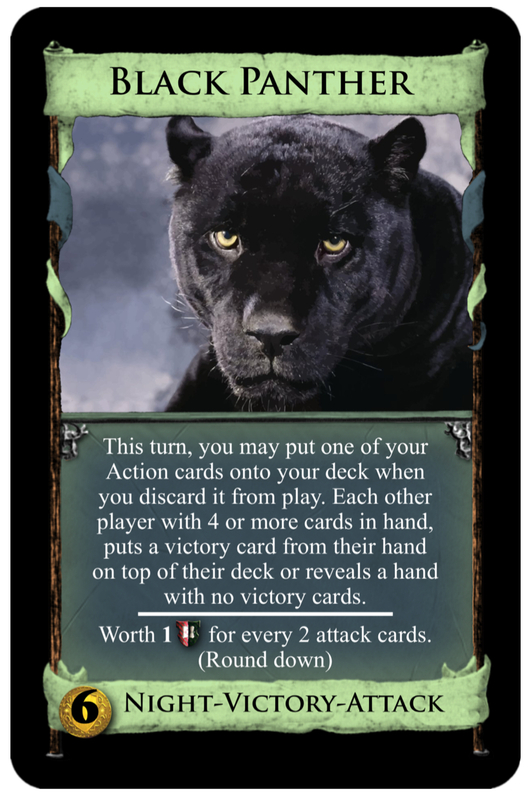 Cause I would like to get all the facts about the cards before I change and maybe a few more responses about tiger and golden cat before I change them. 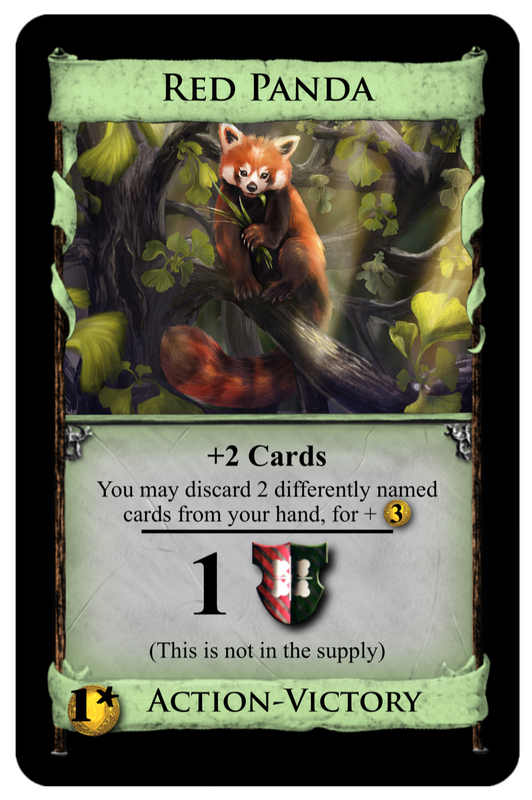 Also I haven’t had any responses about red panda. It’s sort of like mill. 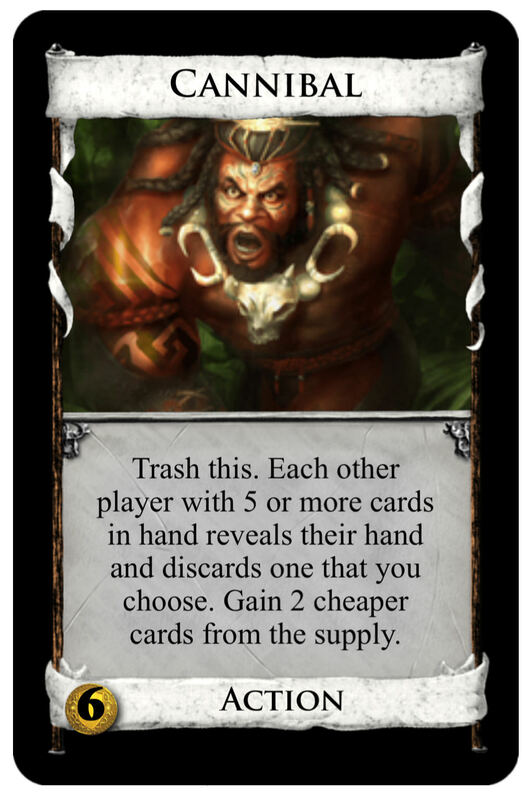 But instead of discarding just 2 cards they have to be different and instead +1 Action it’s +2 Cards. Do you think it’s fine the way it is. What do guys think? 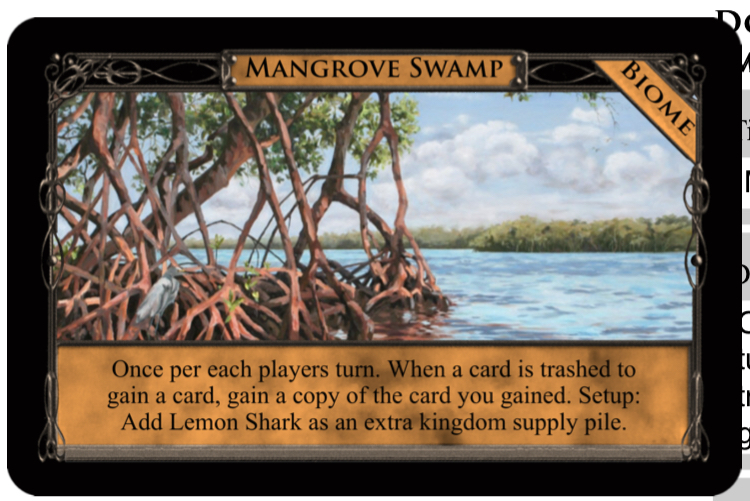 Is it a little better than mill or a little weaker than mill. Of course not that it would be a bad thing if it was stronger cause it would still be harder to get. 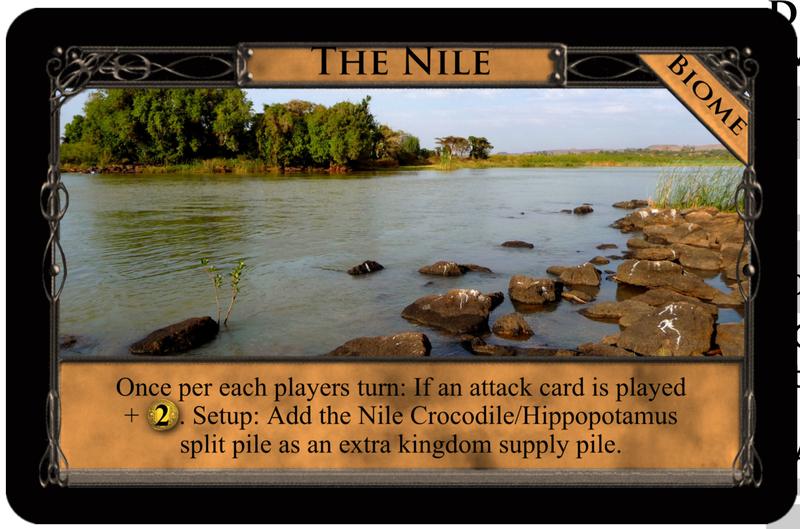 And for adventurers do you think I should alter the amount of cards discarded or is it too many cards? Or not enough? 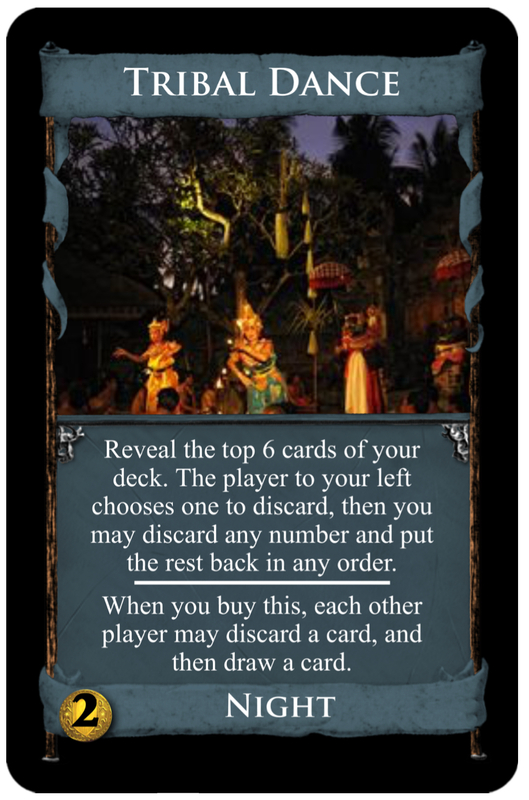 And for langurs I plan to keep it 6 Cards just like the one in nocturne. I like the concept for hyenas. Like using a pack of hyenas, more deadly when added together in multiples. 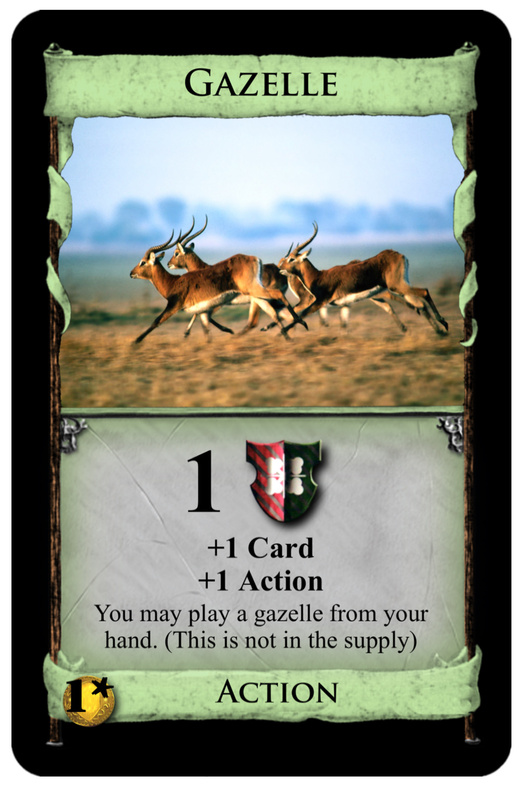 Would you want to put a duration on this card, in case you have more hyenas in hands upcoming? 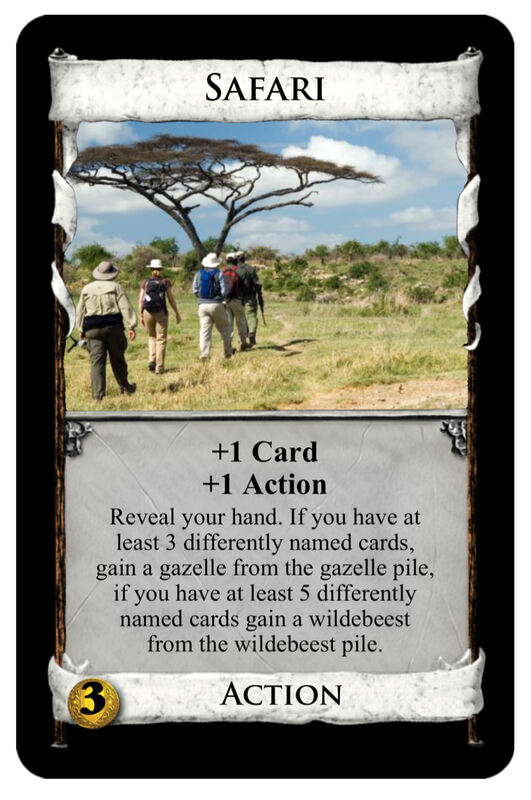 Or a card called ‘call of the wild...’ that let the hyena ‘yelp’ to its packmates? 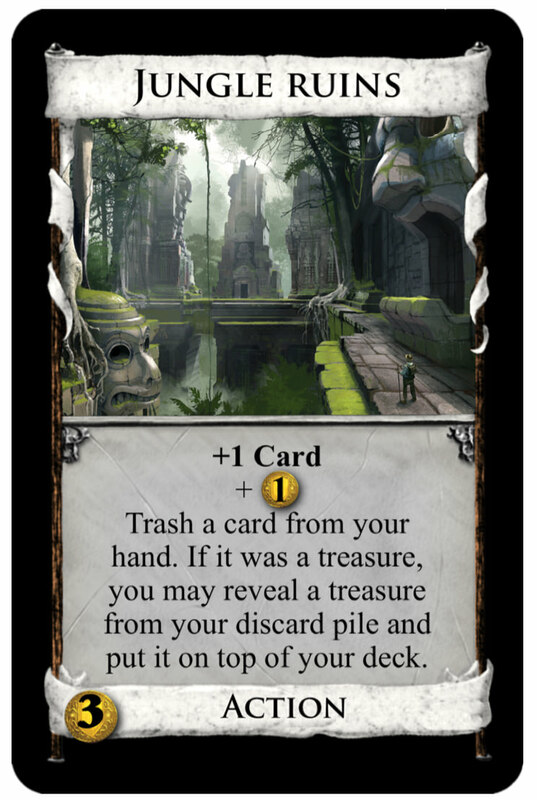 Then if you had a card in discard or your hand you could search for it and add it to the top of your deck..? 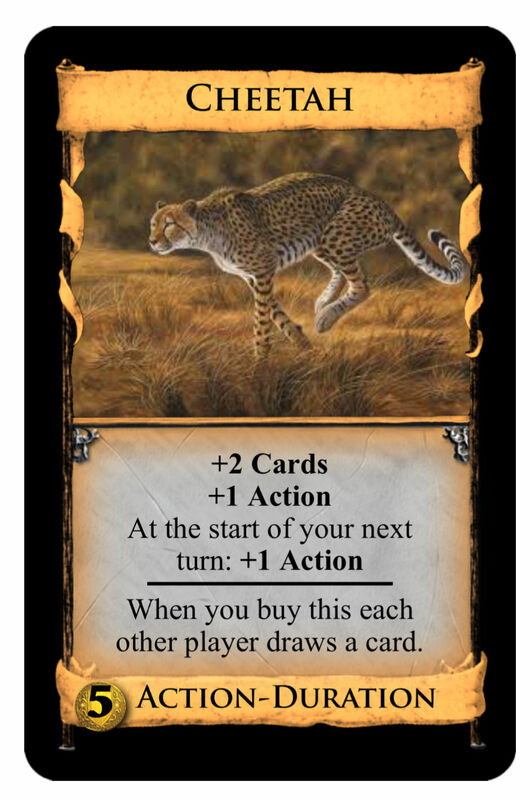 Aren’t there natural phenomena like ‘watering hole’ or rainy season or such...where packs will roam until the phenomena changes herd behavior? 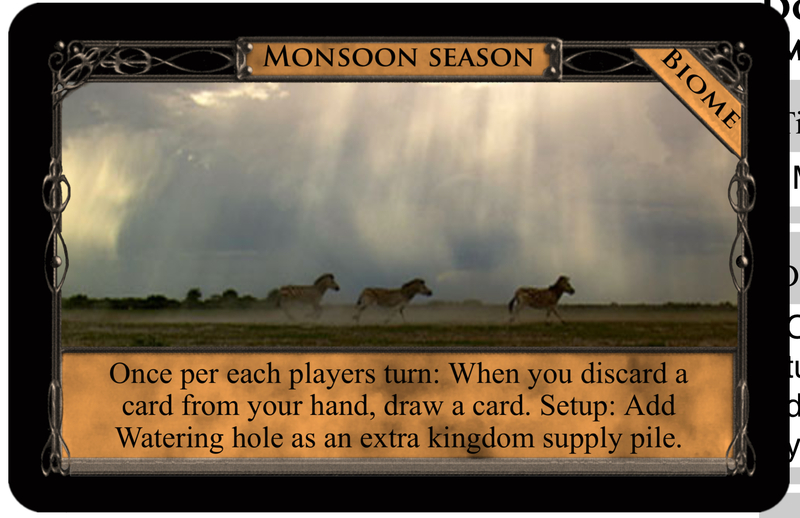 How about adding a ‘season’ concept...kind of like a duration but for multiple hands? The season breaks when someone buys a Duchy is purchased...? 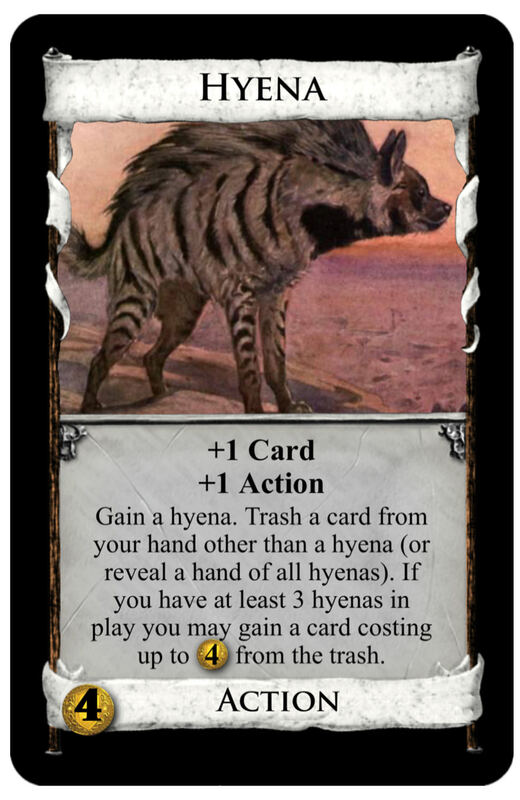 Hyena is the same cost as rats but with the gain function. Shouldn't it be more expensive, or does the trashing keep it the same? 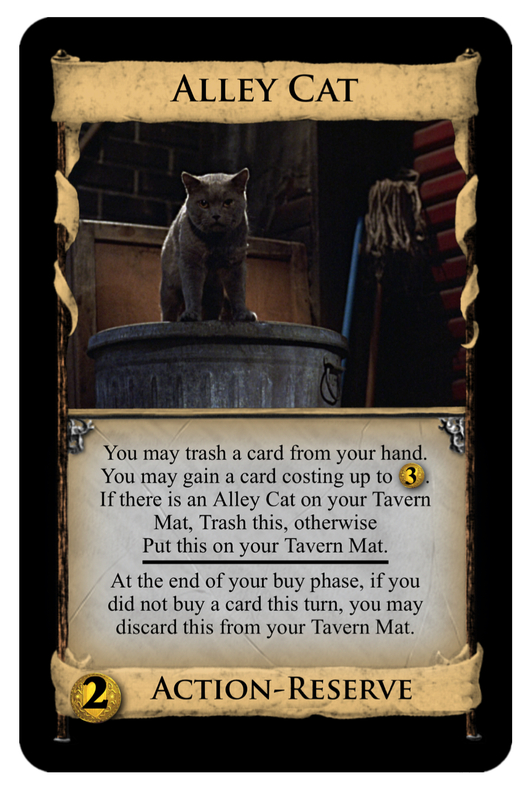 It isn't strictly better because it doesn't have Rats' on-trash bonus. The thing it has instead is also kind of weak, so I think it works at $4. 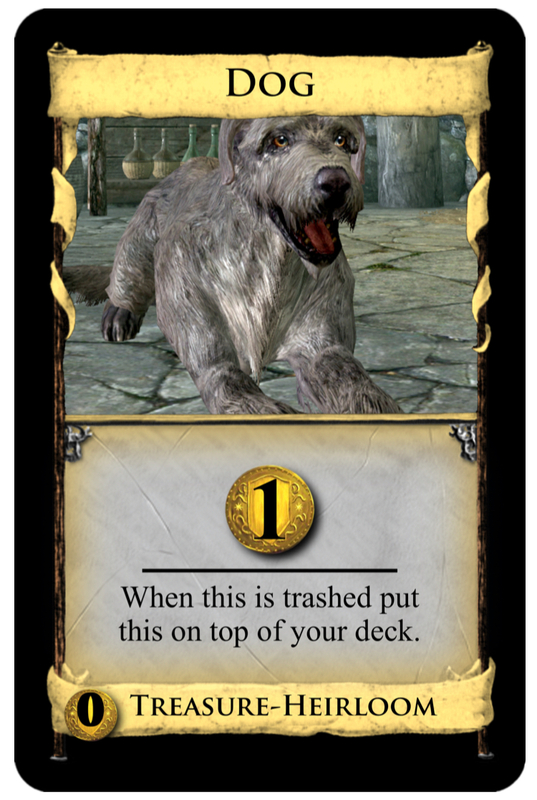 Right it doesn’t have the +1 card when rats is trashed. 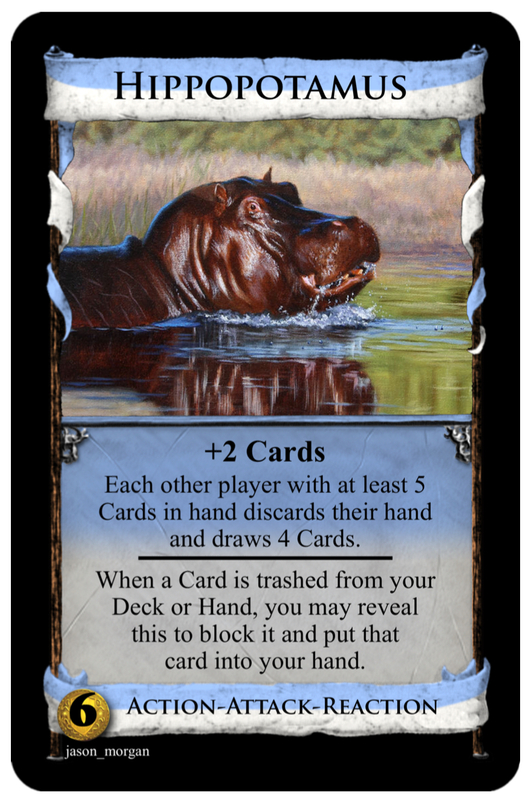 And the gain ability isn’t available until you have trashed a few cards in the same turn with hyena. That’s why I figured it would still work kept at the same price. It still is as useful as rats cleaning your deck of coppers and estates. The reason why I thought it might be a good thing to gain from the trash eventually was that you might have had to trash something like a silver. This way you might be able to get them back. Rats you couldn’t obviously. And rats and hyena in the same game would be epic since they can trash each other. 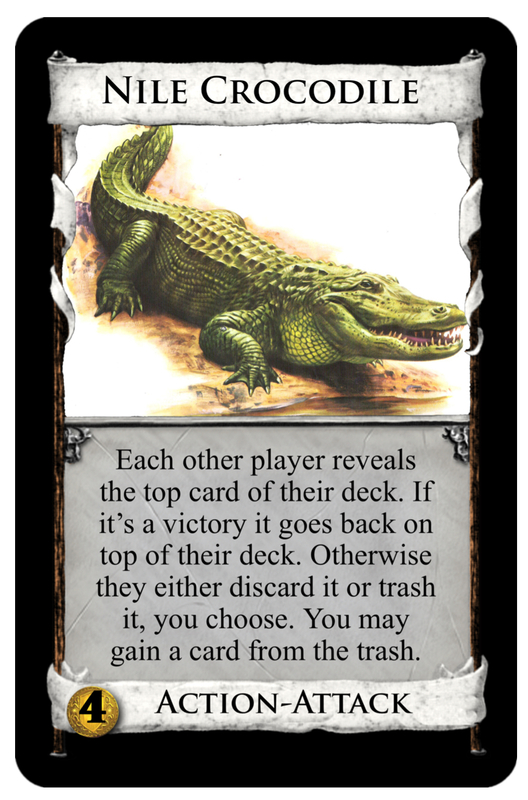 So you might be able to get a lot of cards that were trashed too. 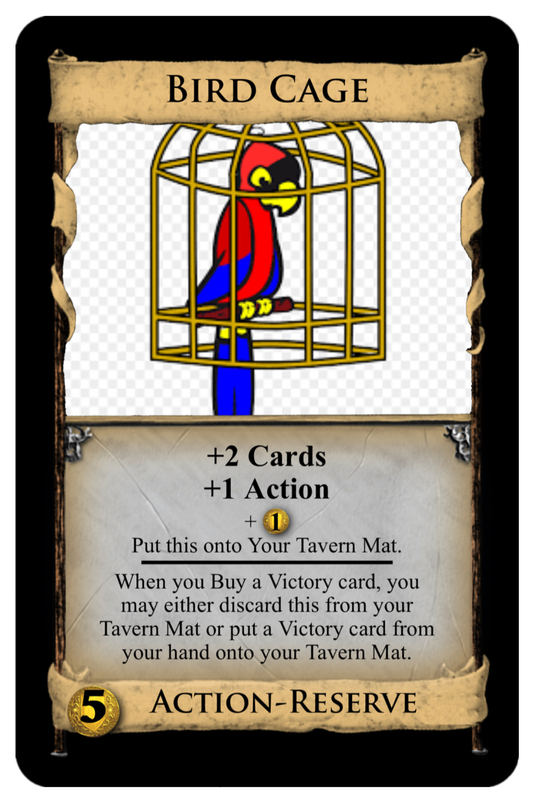 Maybe even other players cards that they lost. 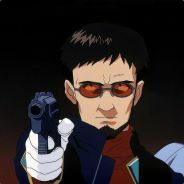 Who does the art on this? Random google images mostly, as long as it doesn’t say product or for sale ect. And they don’t seem to have names attached either. And once in awhile an artist from deviantart, but I always include their name. And some are from various games I’ve played. It still is as useful as rats cleaning your deck of coppers and estates. 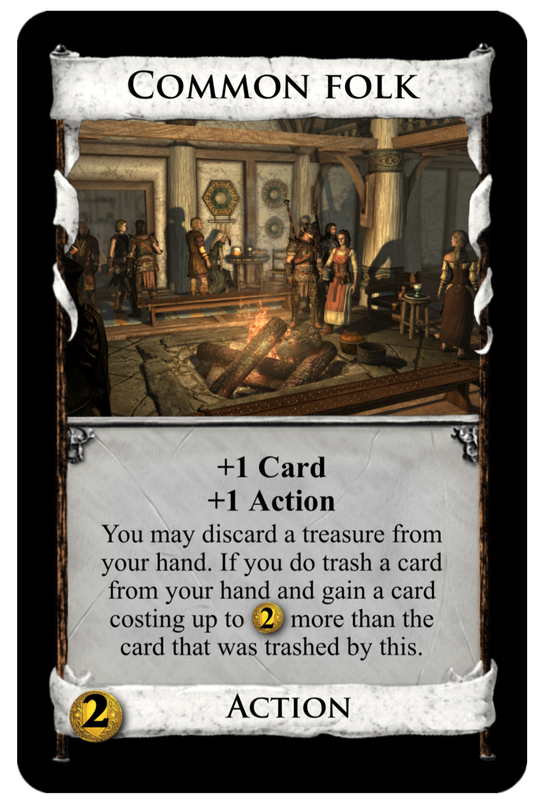 Rats is not at all good at cleaning your deck of Coppers and Estates... it doesn't remove junk, it just replaces junk with other junk. Yeah that’s true. And obviously there will be times when you won’t buy a hyena. 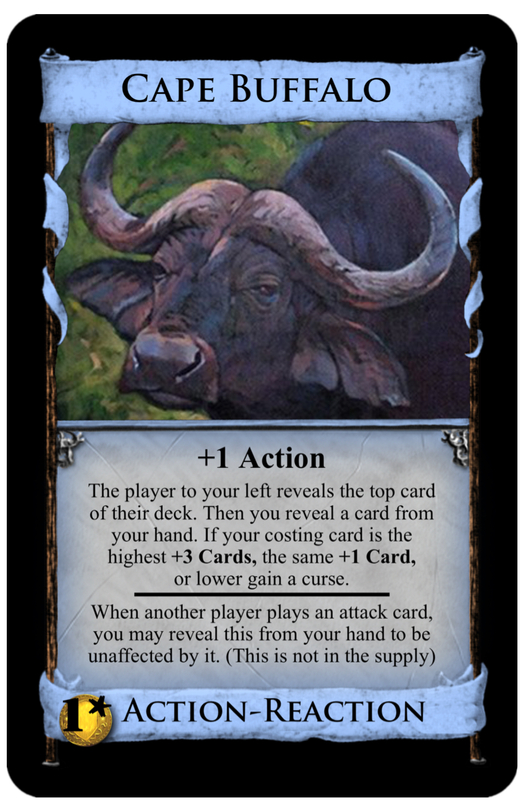 But that can happen with other cards too. However I once played a game where someone won with deck of almost all rats. He had rats and fortress. And there was the event called training and he put his +1 treasure coin on the rats. 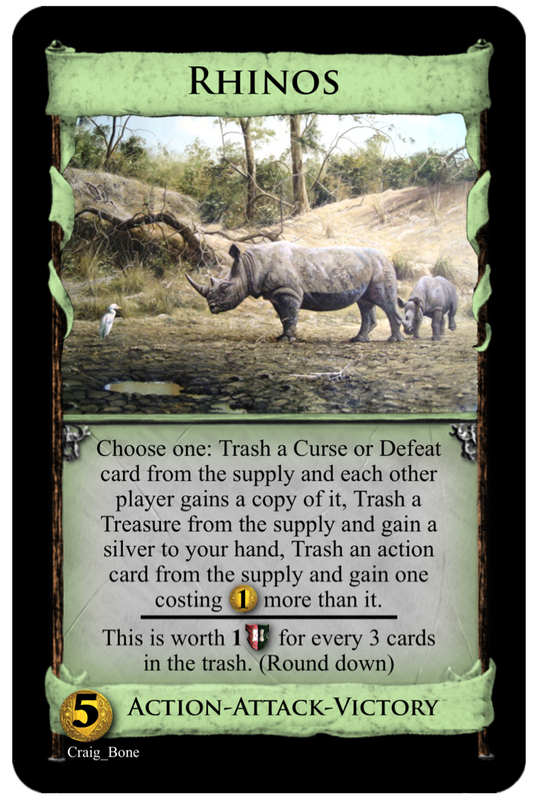 So I’ve been thinking with hyena after the 3rd time played would it work if it also gave you + 2$ in addition to gaining from the trash sorta like a backwards conspirator. And still work as a 4$ costing card? This looks interesting, but it's probably too swingy. Even with a reasonably diverse deck the chances of getting a measly $1 out of this are still pretty high. I do like the basic idea, but I'm not sure at the moment how I would fix it. 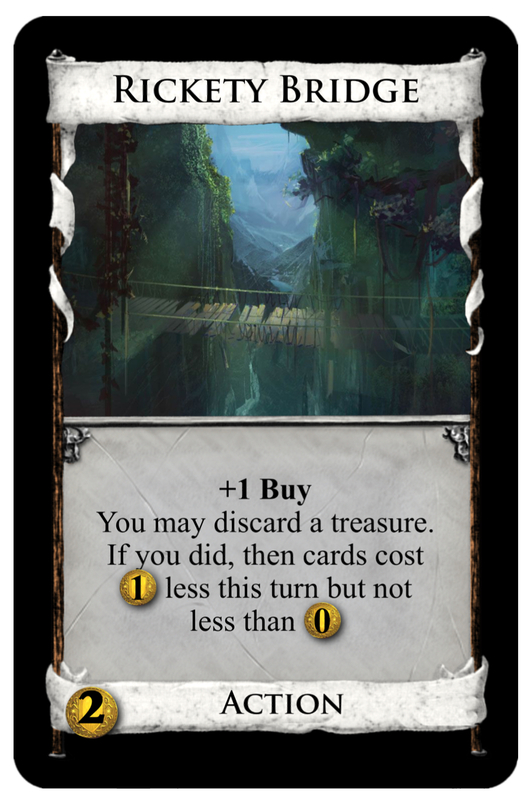 I would definitely drop the Duration part though, since that has nothing to do with the rest of the card.